In just one week, The Walking Dead will finally return from its hiatus with the mid-season premiere, airing Sunday, February 25 at 9 PM ET on AMC. 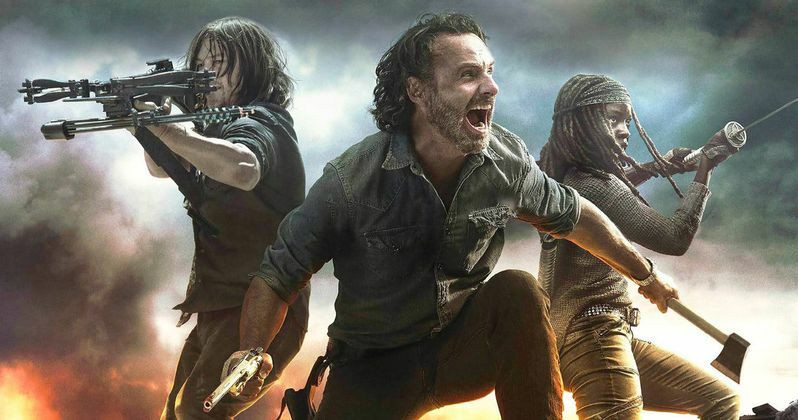 To get fans ready for this highly-anticipated episode, AMC has released a brand new clip, which shows how The Saviors plan to escape from their massive compound known as The Sanctuary, while Morgan (Lennie James) looks on. While we'll have to wait until next week to see how many Saviors actually manage to escape, it certainly won't be easy, thanks to Morgan. The clip opens with Morgan keeping a close eye on The Sanctuary, from an adjacent building, when he sees something quite out of the ordinary. A group of Saviors appear, armed with automatic weapons, as they start firing into the group of fenced-in walkers below. While at first it's unclear why they're doing this, Morgan soon realizes that they're killing off all these walkers to cut a path for them to escape from the Sanctuary. Sure enough, a group of Saviors is seen leaving the Sanctuary, firing at Morgan, who has to make his escape, telling everyone else listening over the radio to get out of there, but before he makes his exit, Morgan sets up an ambush for the exiting Saviors, leading a pack of walkers towards their escape route. While we don't see Morgan make it out of there alive, it seems likely that he'll find safe passage out of there, but his future on the show is unclear. He was recently confirmed as The Walking Dead crossover character, who will have a major role to play in Season 4 of Fear the Walking Dead when that show returns later this year on AMC. Since it seems highly unlikely that the character will be featured on both shows, it seems likely that his time on The Walking Dead may be coming to an end, which could mean that they may kill off his Morgan character, although that hasn't been confirmed. Since Fear the Walking Dead is set a few years behind The Walking Dead timeline, its possible he could be kept alive and return to the flagship series, although that hasn't been confirmed either. It will also be interesting to see if The Walking Dead can find a way to rebound in the ratings, since the show has been on a ratings slide ever since the Season 7 premiere, when both Glenn (Steven Yeun) and Abraham (Michael Cudlitz) were killed off by Negan (Jeffrey Dean Morgan). That particular episode spawned a number of fans to actually file complaints with the FCC, as the ratings continued to slide. Despite the shocking an unexpected reveal of Carl Grimes (Chandler Riggs) being bit in the torso by a walker, with this death likely coming in the mid-season premiere, the mid-season finale for Season 8 dropped 34 percent from the Season 7 midseason finale, although, despite the slide, The Walking Dead is still one of the highest-rated shows on TV. This season has been following the All Out War story line from the Robert Kirkman comics, with many fans wondering if the show will feature the same two-year time jump from the comics, which was the first time a jump like that had happened. While the show does follow the comics in many aspects, it diverges from those stories quite a bit as well, as we all wait to see what's next on The Walking Dead. Take a look at this new clip, courtesy of Ares Promos YouTube.